The team of author Lester and illustrator Munsinger delight children and adults with another installment of Tacky the Penguin stories. 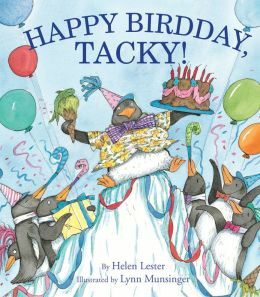 In this episode, several of Tacky’s penguin friends attempt to plan a perfect birdday party for Tacky, and they want it to be a surprise. Goodly, Lovely, Angel, Neatly, and Perfect bake a cake, secure the fishy ice cream, write and illustrate cards, prepare a special birdday card, purchase the extravagant dinner jacket, and line up some penguin entertainment. But, as often happens to an event when Tacky is involved, things don’t necessarily go as originally planned. Tacky wants to dine on the jacket and not in it. He wears the fishy ice cream cone on his head like a hat. He extinguishes the birdday candles with a hair dryer; and then tosses the cake like a football. And after those fiascos, Twinklewebs the Dance Queen, begins to perform her special ballet dance. But her swan song takes a mis-flight, and Twinklewebs is injured, or so the drama-queen thinks. In Tacky fashion, the guest of honor distracts the crowd with his Flapwaddle Dance, and suddenly Twinklewebs recovers and joins him in the dance, along with Tacky’s penguin friends. Lester and Munsinger use the Tacky series to celebrate individuality and differences. The books often mention that Tacky is an “odd bird,” but yet he never fails to delight his friends in the story and charm readers, both children and adults. The stories of Tacky encourage readers to appreciate their uniqueness, as well as the differences of others around them. Second grade readers will like the made-up words, like “flapwaddle,” “birdday,” “tippywebs,” and “Iglooslavia.” Be sure to check the children’s reading comprehension of the story with the created words used in the story and with the words used by the penguin character, Twinklewebs, spoken in an “Iglooslavian” accent. EDITION: Hard Cover, 32 p.